Hosted this year by the lovely Sheryl and unattractive Anthony O'Brien, the Dingos celebrated the halfway point of the season with good food, desserts, and many-a frosty beverage. 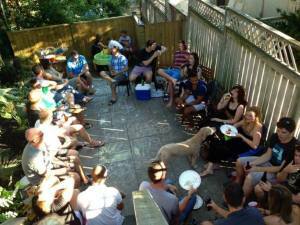 With over 30 Dingos, wives, girlfriends, and kids on hand, it was a chaotic but enjoyable afternoon in the sun. Photos of the event can be found on the Dingos' Facebook page. Thanks again to Sheryl & OB for being such great hosts!